This modern version of Italian-inspired bouilliabase was created in San Francisco. 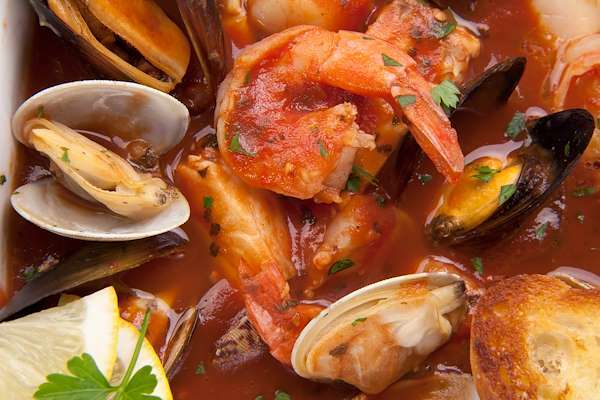 It is a scrumptious blend of clams, mussels, crab, halibut and tender shrimp in a savory tomato broth. Cioppino makes a hearty & rustic meal with plenty of crusty bread for dipping! RecipeSavants.com This modern version of Italian-inspired bouilliabase was created in San Francisco. It is a scrumptious blend of clams, mussels, crab, halibut and tender shrimp in a savory tomato broth. Cioppino makes a hearty & rustic meal with plenty of crusty bread for dipping! Smart Recipes, American Recipes, Fish,Vegetables,Other,Seafood Recipes, Recipes Fish,Vegetables,Other,Seafood American Cioppino PT1H15M Serves 8 Ingredients: 1 Pound Little Neck Clams 1 Pound Mussels 1 Large Dungeness Crab 3 Pounds Halibut Fillets 2 Pounds Large Shrimp 0.5 Cup Extra-Virgin Olive Oil 1 Large Onion 3 Cloves Garlic 1 Large Green Bell Pepper 28 Ounces Italian Style Diced Tomatoes 2 Cups Reserved Shellfish Stock 2 Cups Red Wine 2 Cups Tomato Juice 2 Cups Fish Stock 1 Bay Leaf 1 Small Bunch Fresh Basil 1 Large Bunch Fresh Parsley 2 Teaspoons Salt 1 Teaspoon Freshly Ground Black Pepper In a large stockpot over medium-high heat, insert a metal steam basket and bring 2 cups water to boil. Add clams & mussels, cover, and steam until the shells just open, about 5 minutes. Discard any seafood that doesn't open. Drain the shellfish, and reserve the cooking liquid. Set aside. Crack and remove the meat from the crab legs. Meanwhile prepare a herb bouquet, by placing the bay leaf, basil and 1/2 of the parsley in a sheet of cheesecloth and tieing up into a tight bundle. Heat the stock pot over medium-high heat, and heat the oil and saute the onions until softend, about 5 minutes. Stir in the minced garlic and saute until fragrant, about 1 minute more. Stir in tomatoes, reserved shellfish stock, wine, tomato juice & fish stock. Stir in the salt, pepper and prepared herb bouquet. Bring to a simmer for 20 minutes. Remove and discard teh herb bouquet. Stir the cubed halibut into the soup and cook covered for 5 minutes, stir in the reserved shellfish and crab and simmer for anthoer 3 minutes. Serve the soup in large bowls with a healthy sprinkle of fresh parsley and a thick slice of garlic bread. If you enjoyed this easy seafood dish, you'll love these fresh ideas! Mediterranean cuisine offers some of the best treasures of the sea, like this tasty calamari recipe. The dish pairs briny olives with tender squid and classic Mediterranean herbs & spices. Wrap the seasoned olives in a foil pocket and throw them on the grill with the squid. You will have an elegant platter of calamari in no time! This rustic seafood & pasta dish is easy to make and is brimming with flavor. The al dente pasta is mixed with toasted bread crumbs and aromatic herbs, then topped with tender clams. Your family will feel like they are visiting your favorite seafood restaurant! Share King Poseidon’s bounty of the sea with this mouth-watering seafood paella! It is a savory blend of shrimp, squid, clams, and sautéed veggies in rice and aromatic broth. This classic seafood dish only looks difficult—because it is easy to make in one skillet. 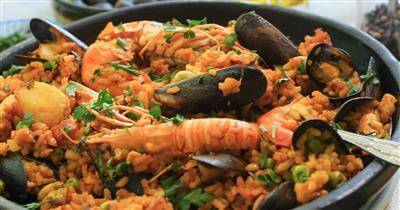 Serve steaming bowls of paella with plenty of crusty bread to soak up the delicious seafood-infused juice! Are you a seafood aficionado? 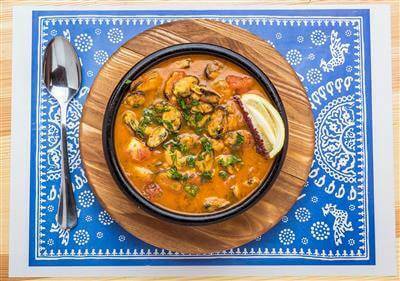 Then you will adore bouillabaisse, the classic French seafood soup. Don’t let its elegant presentation fool you, because it is a cinch to make! The tomato-based broth is seasoned with garlic, onions, and other savory spices. Cook generous chunks of white fish and prawns in the broth until done, and serve the soup with plenty of crusty bread.